SuperWeb LLC has once again shocked the world by releasing a new yet worthless adware program called Metal Maker. The company has been very active during recent months, releasing adware using the same old cloning technique we’ve all come to know and resent. Needless to say, that you should remove the program, because it is considered as a hazardous infection that could wreak havoc on your computer. At first glance the program seems to be harmless as it only shows commercial advertisements, but the ads could redirect you to infected websites that could infect your system with malware if you click anything. 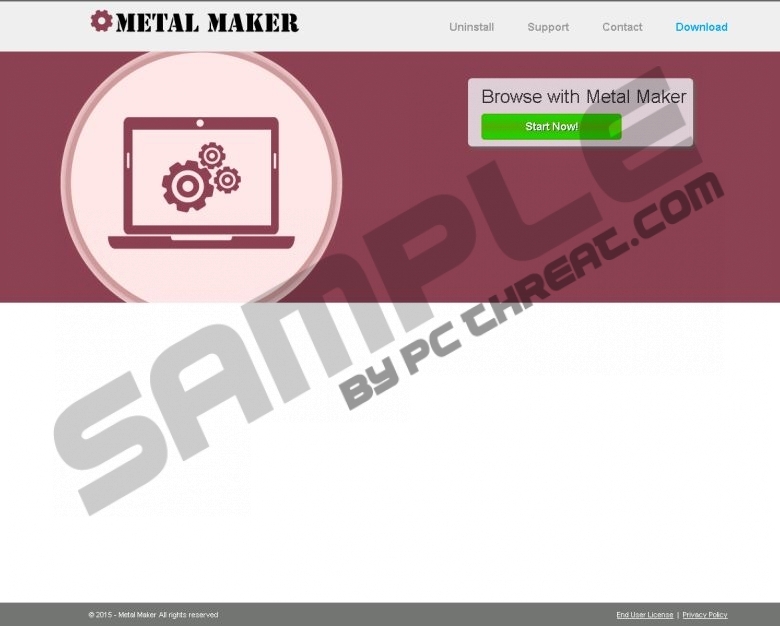 Metal Maker is being advertised on a website called Mymetalmaker.com. Typically of all SuperWeb infections it features the same information and appearance of the website. The website is almost identical to the websites of previous clones, only difference being the name, logo, and color scheme. Of course you cannot download the infection from its website as the download button doesn’t work. However, Metal Maker is known to be distributed via freeware bundles that can be downloaded from freeware distribution websites such as Brothersoft.com, Soft32.com, Softepedia.com, and so on. At any rate, you can still avoid getting infected with the adware by choosing advanced installation settings. Simply run the installation wizard, click advanced/custom settings and remove the adware from the installation process by unchecking the checkbox. Metal Maker is an annoying and intrusive adware application as it displays numerous advertisements in various forms. Typically the adware should display coupons, pop-ups, in-text ads, and so on. You should remove it as its developers at SuperWeb fail to endorse the content they promote. This is dangerous, because the developers neglect their responsibility to provide safe content. Metal Maker could be used to promote misleading ads supplied by shady entities. It means that users might get duped when purchasing a product or service, which doesn’t exist. You ought to remove this program, because cyber criminals may use it as a means of infecting computers with malware such as ransomware, which will lock your computer up and demand money in order to unlock it. Obviously, Metal Maker is a significant threat to the security of your system. It tries to infect your computer via software bundles, which are often installed hastefully. The program displays advertisements of unreliable nature that could be provided by cyber criminals who aim to infect you PC with malware and extort money from you. So, we recommend that you remove Metal Maker immediately. Find Metal Maker and click Uninstall. Quick & tested solution for Metal Maker removal.